This beetroot dip is inspired by my latest favourite store-bought dip. I picked up the store-bought version a couple months ago at a health food store and have been obsessed with it ever since. The stuff ain’t cheap though. Like, it’s $10 for a small tub! That’s a lot. So, what did I do? Made my own! Not only is it satisfying making your own, but it’s also less expensive and you yield SO much!! I used pre-cooked beets for this beetroot dip (like I did for my fall farro salad). What I love about those pre-cooked ones is that (for obvious reasons), it saves a TON of time. Plus, my kitchen doesn’t end up looking like a scene from Dexter. No joke, you guys, I have a white counter and, honest to goodness, no matter what I’m making I always end up with it all over myself and the kitchen. Place cooked beets in a food processor. Add cashews, sunflower seeds, salt and balsamic vinegar. Blend Again. Add oil and blend again. The number of beets you use will vary depending on their size. You want about 1 lb in total. Use your grocery store’s scale if you don’t have one at home. 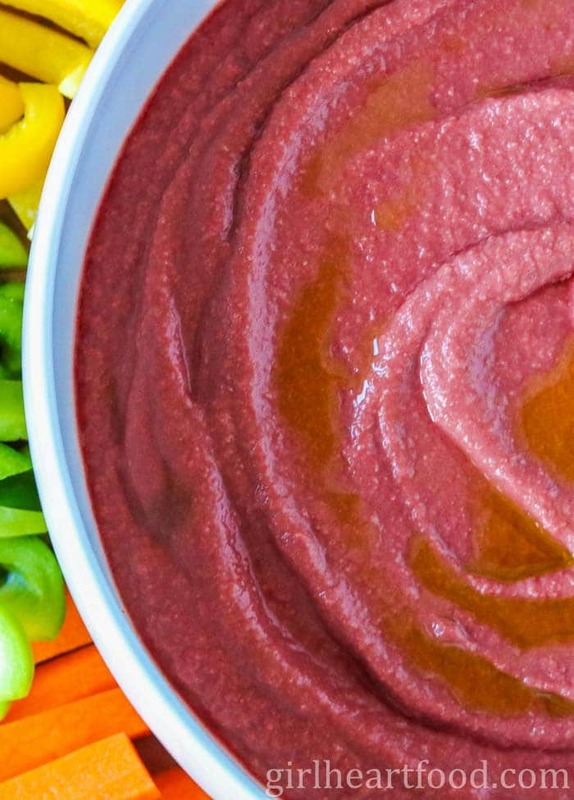 This beet cashew dip yields quite a bit. It didn’t last long in our home, but feel free to half the recipe if you like. Don’t forget to soak those cashews and sunflower seeds in water overnight. They help thicken and make this beetroot dip nice-n-creamy. Oh – and drain ’em before you use in this dip. Loving this flavor combination, Dawn! And I love that it’s both delicious and nutritious (to even out all of the cookies I’ve been eating lately!) And it’s such a festive color for the holidays! I adore you for making this dip! I adore beets – and usually make a bean and beet dip – this however, with cashews sounds wonderful, so thick and creamy! And not only way more economical than that $10 dip but a lot healthier too! Thank you Mike! It’s a tasty one 🙂 Hope you get a chance to try it out soon! Dexter…you seriously cracked me up! But I do understand what you mean. I adore beets, but my personal issue is my hands once I’ve peeled them – I bet they often look like Dexter’s hands (And even gloves don’t always help) when he’s finished his own business 🙂 Anyway, as a huge fan of beets, I’ll say YES to this delicious dip! Lol!! I had to go there 😉 Thanks Ben! Now this is the kind of dip I need for the holidays Dawn! Nice and healthy to balance all those cookies I’ve been enjoying! Pinned! This is just the prettiest dip I’ve ever seen! I LOVE beets but totally agree that they’re ridiculously messy to work with. Buying pre-cooked is the perfect solution! Have a great weekend, Dawn! Awwww – thank you Kelsie 🙂 Hope you have a wonderful week! Such a fun dip Dawn! The store bought ones can certainly be expensive! Looking forward to trying this recipe soon. You know I need to try this one Dawn! Love creamy, dairy-free dips! I make cashew dip on the regular, and adding beets is just genius. Love the colour and the texture in these photos! And, as a side note, I can totally relate to the state of your counter tops after cooking with beets! The pre-cooked ones are definitely a good suggestion. Hope you’re having a great week! Yay! I can’t believe how fast fall is going by! Let me know if you give this one a go, Katherine 🙂 Thanks so much! Great idea to make this at home yourself and so simple! 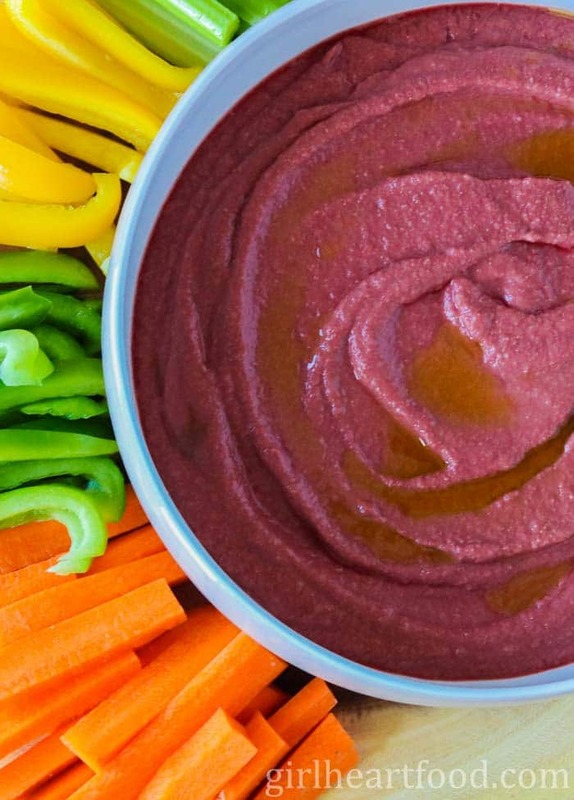 Perfect healthy dip for the holidays! For sure 🙂 Thanks Kevin! So on board with making it on your own versus paying an arm and a leg for the store-bought version! LOL! Loving the color and texture of this dip, Dawn! It would go perfect on game days…you know, when I’m stuffing my face instead of actually watching any football! Umph. $10 a tub would indeed get expensive…especially since I would be polishing this off in record speed! The flavor here sounds amazing, Dawn. Also, I totally know what you mean with making a mess in the kitchen. I feel like I spend half my day just cleaning up behind myself. Haha!